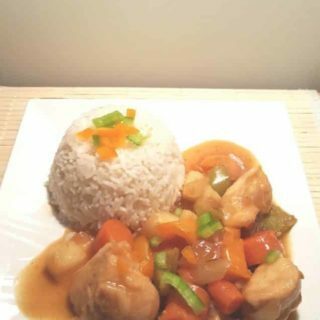 Instant Pot Pressure Cooker Chinese Orange Pepper Chicken & Rice is cooked in one pot, along with the Rice. This One Pot Pressure Cooker Chinese Orange Pepper Chicken & Rice has bursts of orange flavor and sweet and spicy bell peppers. The rice is cooked in the Instant Pot or Pressure Cooker at the same time as the Chicken, using the Pot in Pot method. 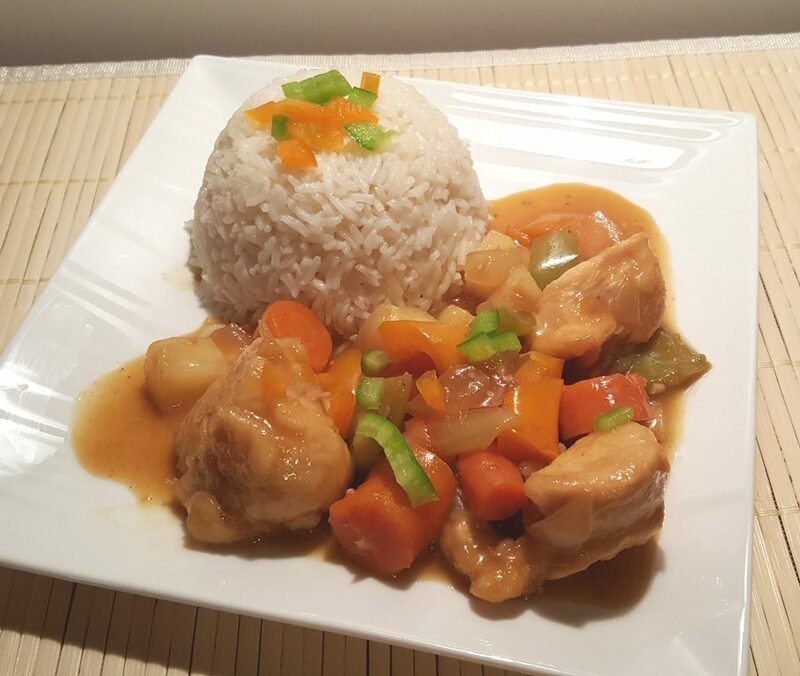 The other day, Genene Abraham, from one of my Pressure Cooking Facebook groups, posted a recipe she had made called Sweet Pepper Chicken. She was kind enough to allow me to use her recipe. We talked about what she would like to add and/or change. She wanted me to make the recipe and use Healthy Boy Sweet/Black Soy Sauce (my favorite brand) instead of Honey. She is a silly one, that Genene. She has never tried Sweet/Black Soy Sauce, but knows that I love to use it in cooking. I’m wondering if she secretly purchased a bottle. Don’t forget to ask her, if you see her around the web. Genene and I went back and forth on ingredients a bit and the recipe then became quite different than the original. 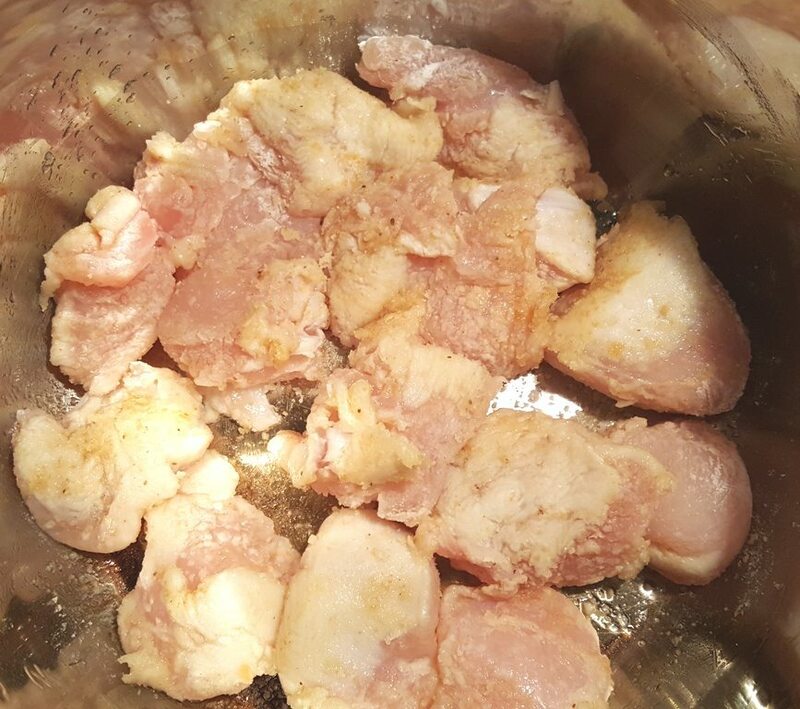 Chicken, especially white meat chicken, is really tricky in the Instant Pot or Pressure Cooker and I wanted to try a new concept. It worked and it worked well! Succulent chicken. Then came the naming of this dish. That was the hardest part. She also wanted me to use Chinese Five Spice. 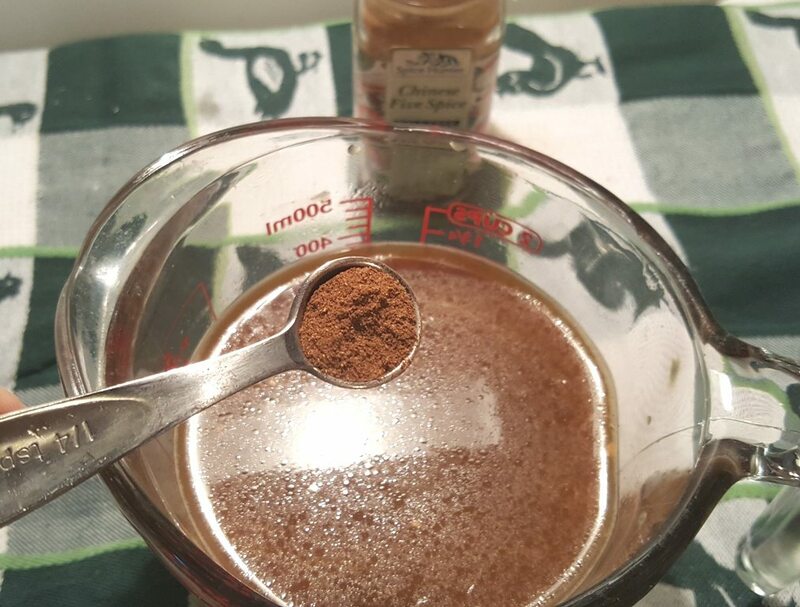 I’m a big fan of Chinese Five Spice and Sweet/Black Soy Sauce and the recipe was under way. If I recall, all the ingredients were added to the pot at once and then cooked for quite a while. I also really wanted to cook the rice at the same time as the chicken and make it a one pot meal. Challenge accepted, let the fun begin! In this recipe, size is important! As I said above, white meat chicken in the Instant Pot or Pressure Cooker can be rather tricky, if you don’t know what you are doing. I keep hearing about rubbery chicken and that’s no good. No one wants to eat rubbery chicken. I am also not a fan of white meat chicken. I will tell you, that with the method I used, the chicken was juicy, moist and tender! Before beginning to cook, have all the ingredients, chicken, sauce and rice prepped and ready to go. This will move very fast. 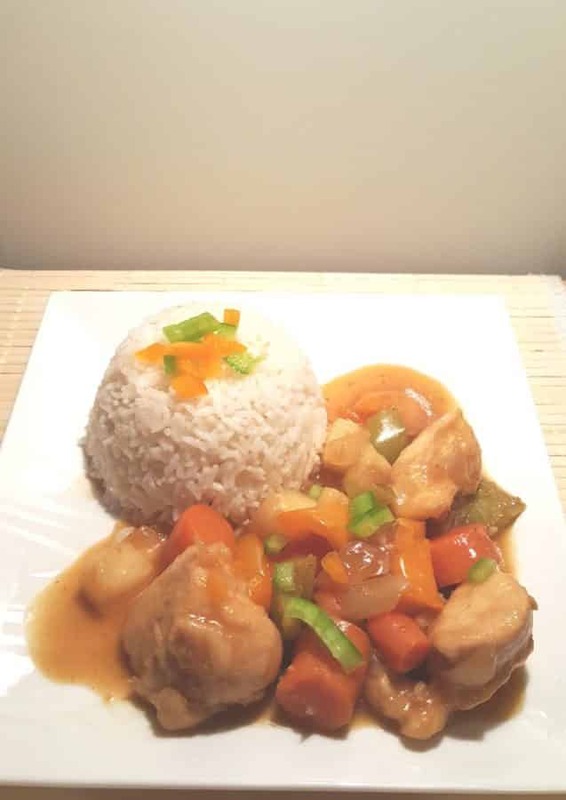 If you would like to cook your rice at the same time and in the same pot with your Pressure Cooker Chinese Orange Pepper Chicken, please check out my Pressure Cooker Perfectly Cooked Pot In Pot Rice recipe for step by step instructions. 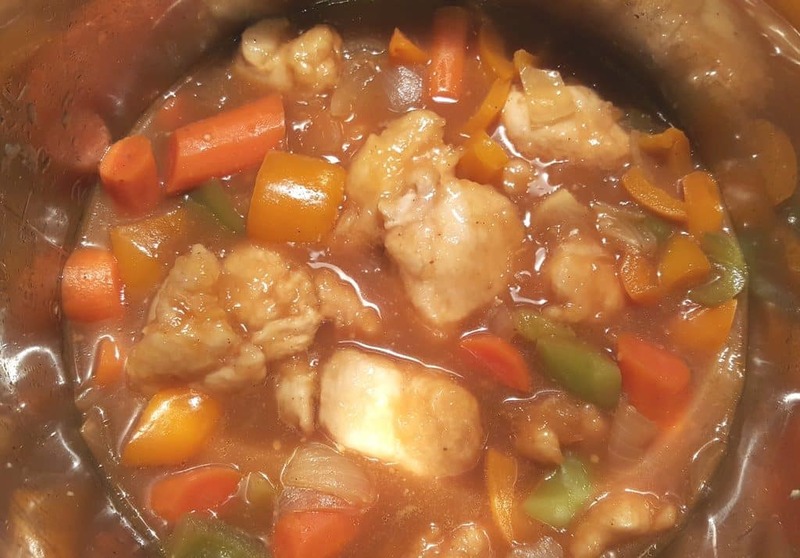 Turn this Pressure Cooker Chinese Orange Pepper Chicken recipe into a one pot meal! You will just need these two accessories. One Round Dessert Pan or Tiffin Pan Set for Pot in Pot Rice and Desserts and a Stainless Steel Tall Legged Trivet. When creating recipes, there is a balance between amount of water needed to get to pressure, cook time, ingredients and Natural Pressure Release time. I almost always use a shorter cook time with a longer Natural Pressure Release time. 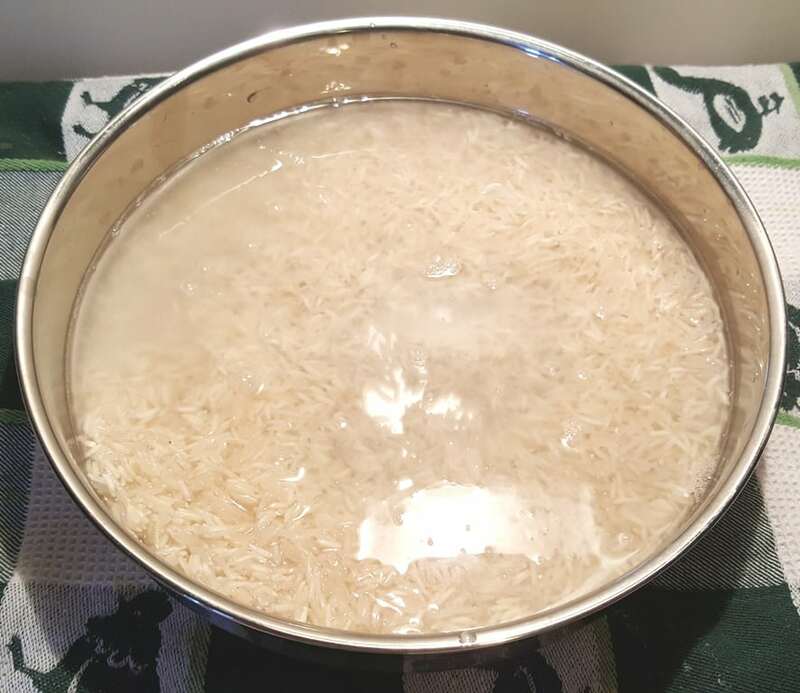 It is important to rinse the rice with water until the water runs clear. This will make the rice cook and taster much better. I know many of you use your 1.5 Quart Stainless Steel “Pot in Pot” Bowl for Pot in Pot cooking. I first tried this recipe using that bowl and much prefer the Round Dessert Pan. The rice cooked more evenly and was totally perfect. 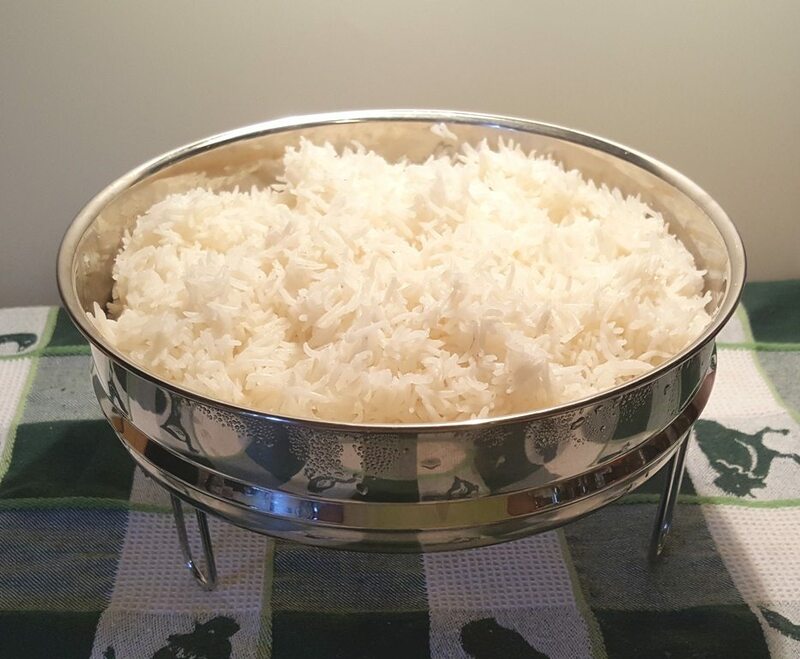 Plus, if you want a larger amount of rice, you could double the recipe and then use a Shorter Stainless Steel Trivet. Since vegetables cook really fast in the Instant Pot or Pressure Cooker, I like to rough chop my vegetables. If you cut them to small, they will disintegrate into the food. Save some of the peppers to use as a garnish. The carrots should be cut into about one inch chunks, or more, if you like. After all vegetables are cut, place them all in a Mixing Bowl, so that you can dump them all in at once. Remember, this moves fast and we don’t want the chicken to continue cooking all on its own. Why should I use Potato Starch? As I said, in this recipe, size does matter. 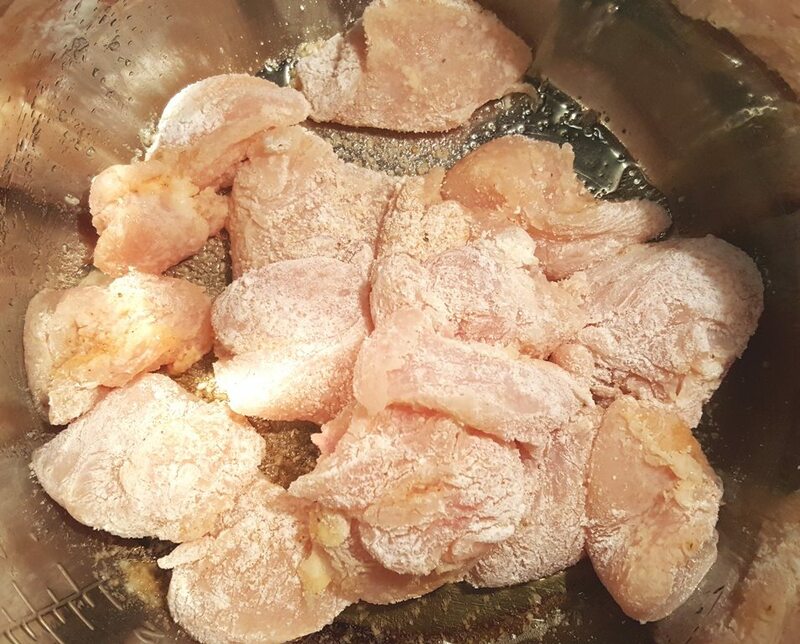 The chicken breasts should be cut into large chunks. You don’t want them to be bite size. More like two to three bites….. probably two bites for men. Hehehehehe. Cutting them into large chunks will ensure perfect results. I love to cook with Potato Starch, rather than cornstarch or flour. 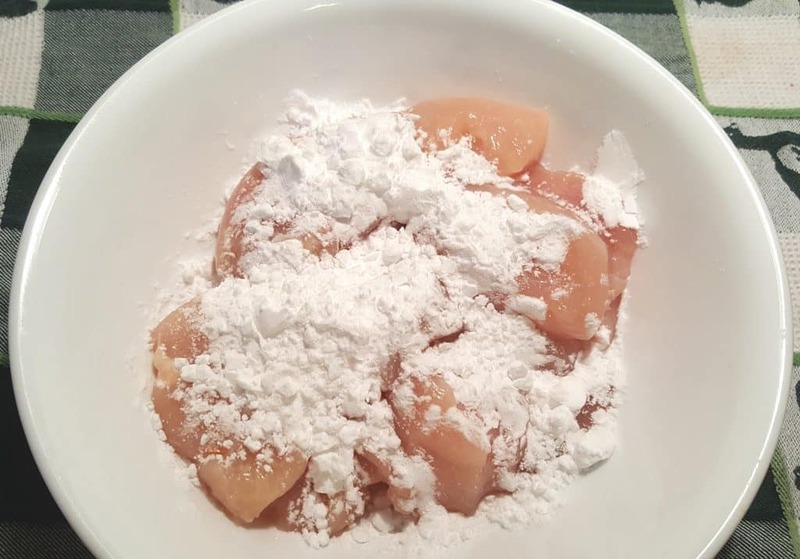 Coating white meat chicken with Potato Starch, will protect the chicken from drying out and becoming rubbery. Plus, you won’t need to add any thickener at the end of the recipe! The taste is better, it’s light and I feel it does a terrific job. It helps seal in the juices and will provide some thickness to the sauce, without having to make a slurry. 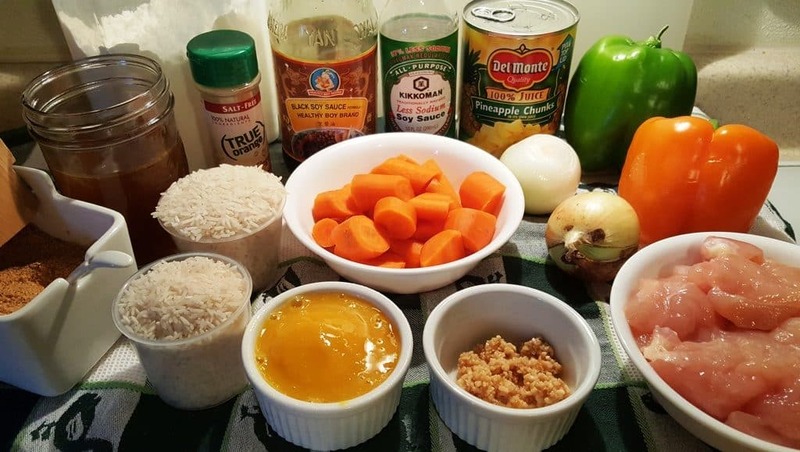 I’ll be incorporating the method I used in this One Pot Pressure Cooker Chinese Orange Pepper Chicken & Rice into many of my already published recipes, so be sure to check other chicken recipes that you might have already saved. Sprinkle the Seasoned Salt and the True Orange Ginger over the Potato Starch. True Orange Ginger is optional, but will add a burst of Orange flavor. I use the True Crystalized products a lot. The citrus is in crystalized form and tastes like you just went outside and picked an orange off the tree. It’s that good. I like to use it when I want the citrus taste, but without adding additional liquid. A perfect example is my Mexican Corn on the Cob (Elote). I wanted a strong lime taste in the sauce, but did not want to add any liquid and have a very wet corn. Make sure your hands are very dry and coat the chicken well. I use Tongs to move the chicken around, so that the Potato Starch won’t stick to my hands. Into your Measuring Cup full of chicken broth, add in 4 ounces of the concentrated orange juice and the Chinese Five Spice. Genene also wanted me to incorporate Chinese Five Spice in the recipe. We are going to hold back some of the frozen juice to add after we release pressure, to get another burst of orange. Whisk the sauce together and set it aside. You are now ready to start cooking. Select Sauté or Browning on your Instant Pot or Pressure Cooker and allow it to fully heat. To make a stainless steel pot non-stick, it is important to allow the pot to heat before adding your fat. Add about a Tablespoon of Ghee to the cooking pot and it will melt fast. Pressure Slow Cooker Simple Ghee is easy to make and great under high heats, so it won’t burn. If you don’t want to make Ghee, you can always purchase it by clicking here. Alternatively, Olive Oil will work okay. I just prefer the Ghee taste over the Olive Oil in this recipe. You can see there is just a little sear on the chicken. The Potato Starch is staying nicely in place. You don’t want a clump of starch in your Instant Pot or Pressure Cooker cooking pot, that is for sure! You’ll get a nasty mess and the pot won’t come up to pressure if it gets gunked up from excess Potato Starch. Hit the Off button on the Instant Pot or Pressure Cooker. Dump in all the vegetables and mix them in with the chicken to get the chicken off of the bottom. 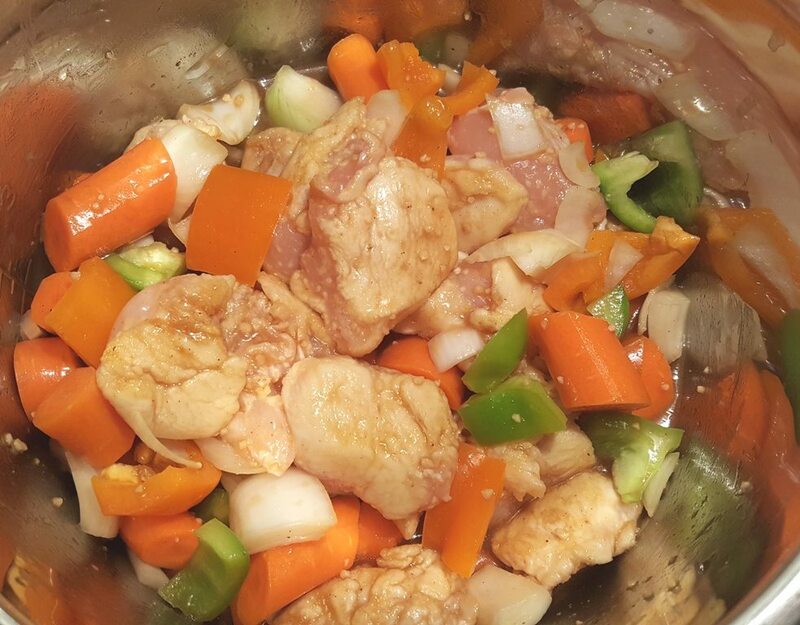 Pour in the sauce and mix it through the chicken and vegetables. As mentioned above, there is no need to make a slurry at the end of the cook time to thicken the sauce. The Potato Starch on the chicken will thicken it up, just right. Look at the above photo. You can see that there is no starch floating around…it is all nicely stuck to the chicken. 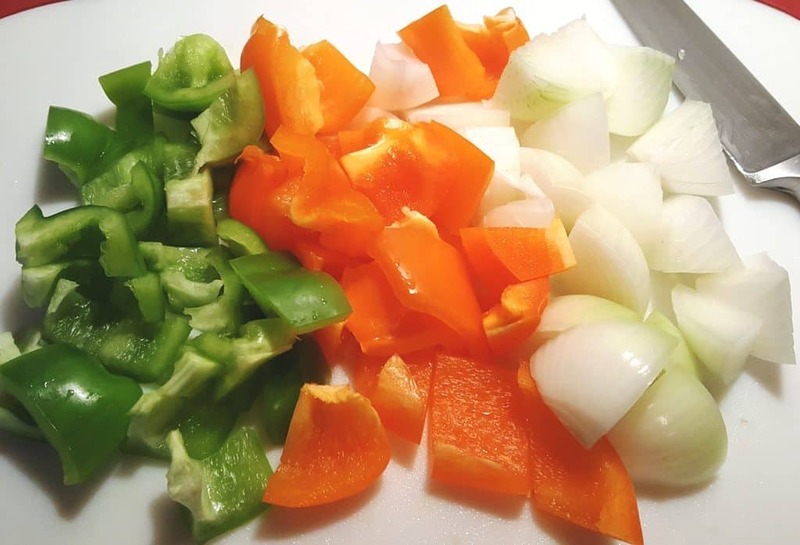 While the chicken is cooking, dice up the reserved bell peppers. 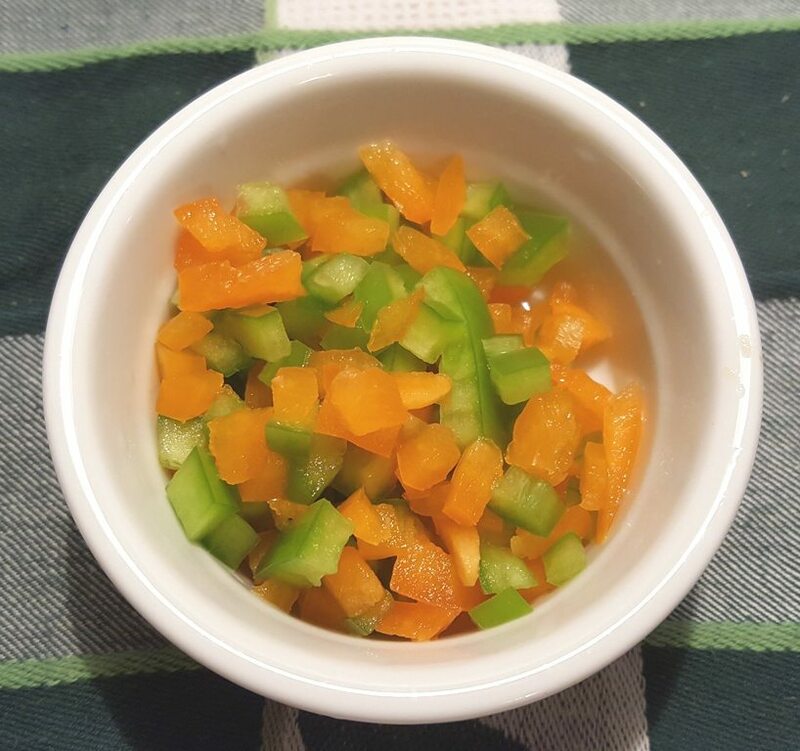 I really wanted to add some bright and fresh color and crunch to the Pressure Cooker Chinese Orange Pepper Chicken. 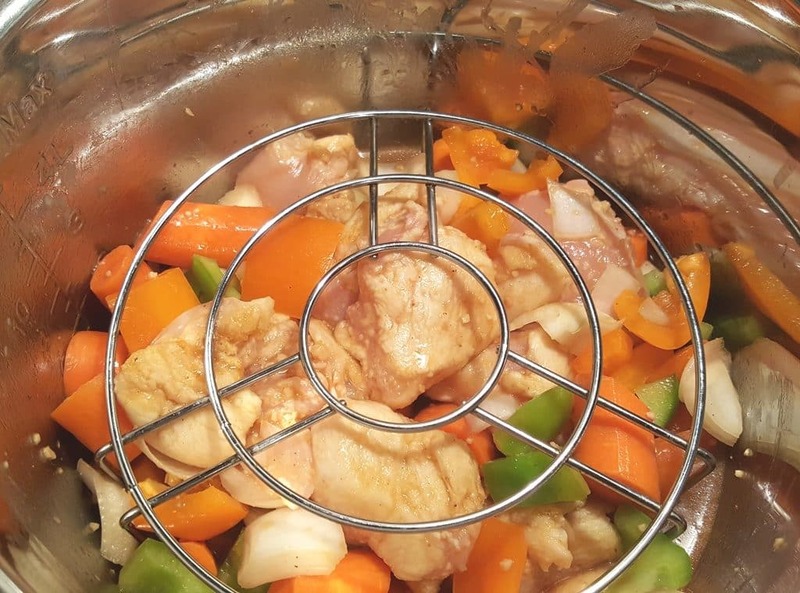 The One Pot Pressure Cooker Chinese Orange Pepper Chicken & Rice, has a short cook time, so we will let the chicken and rice finish cooking and steaming, during a ten minute Natural Pressure Release. Open the pot and remove the Pan of rice. Fluff it with a fork. It will be perfectly cooked. Dump the rest of the Frozen Concentrated Orange Juice and some pineapple chunks into your Instant Pot or Pressure Cooker and mix through. Hit the Sauté or Browning button to warm the Orange Juice and Pineapple chunks. If you don’t want Pineapple in your food, just leave it out. I prefer this dish without the Pineapple. Some of my testers enjoyed the Pineapple in the dish. The sauce will heat back up in just a minute or two. The sauce is already a nice consistency and may thicken a bit more. If you want the sauce even thicker, just keep simmering until you get the consistency you desire. Keep in mind though, the Pressure Cooker Chinese Orange Pepper Chicken will continue to cook and may over cook. Remember, it will still thicken up as you serve. The Potato Starch helps the chicken keep in the moisture. Rinse rice and place in small stainless steel bowl with fresh water. Set aside. 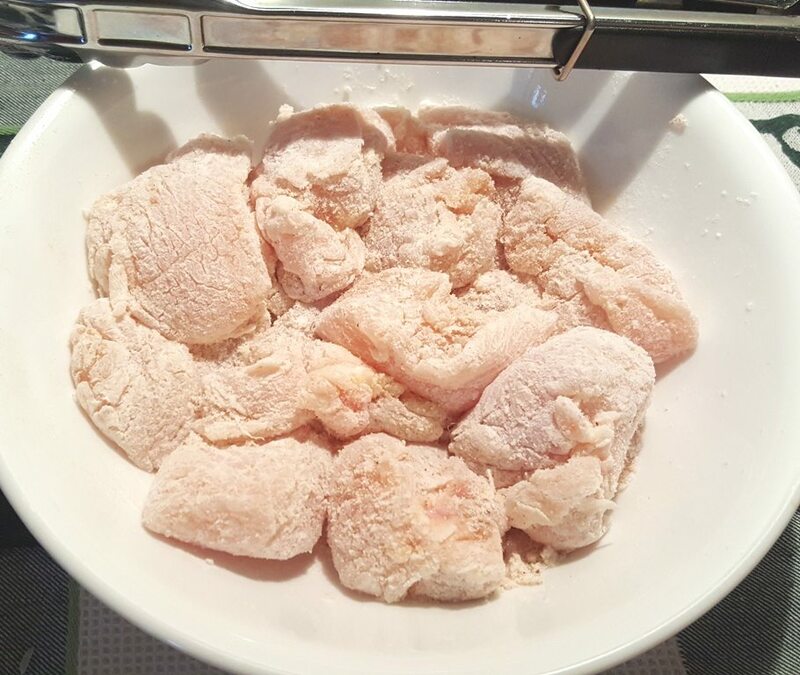 Cut chicken into large chunks and pat dry. Place in large bowl. 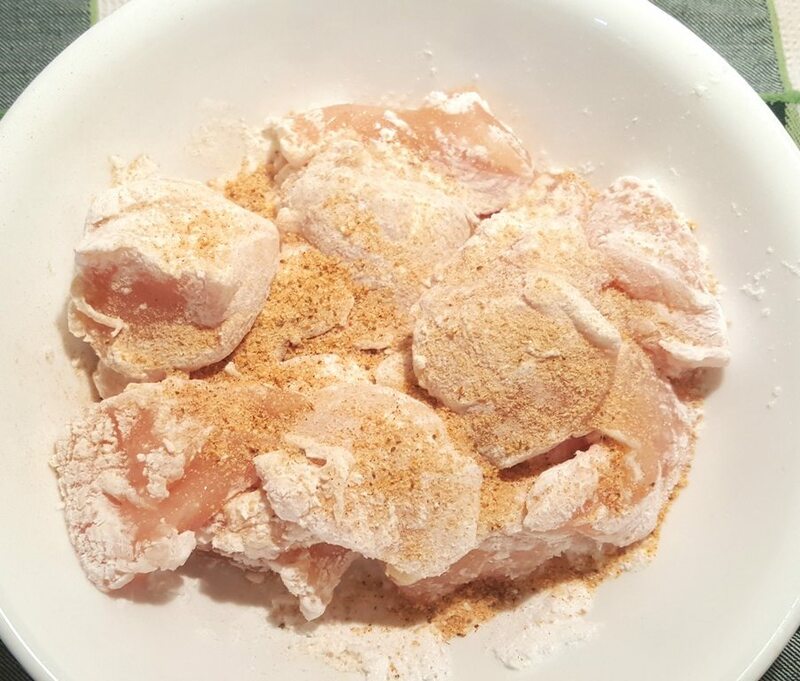 Sprinkle potato starch over chicken and add seasoned salt and True Orange Ginger (if using). Mix to coat chicken. 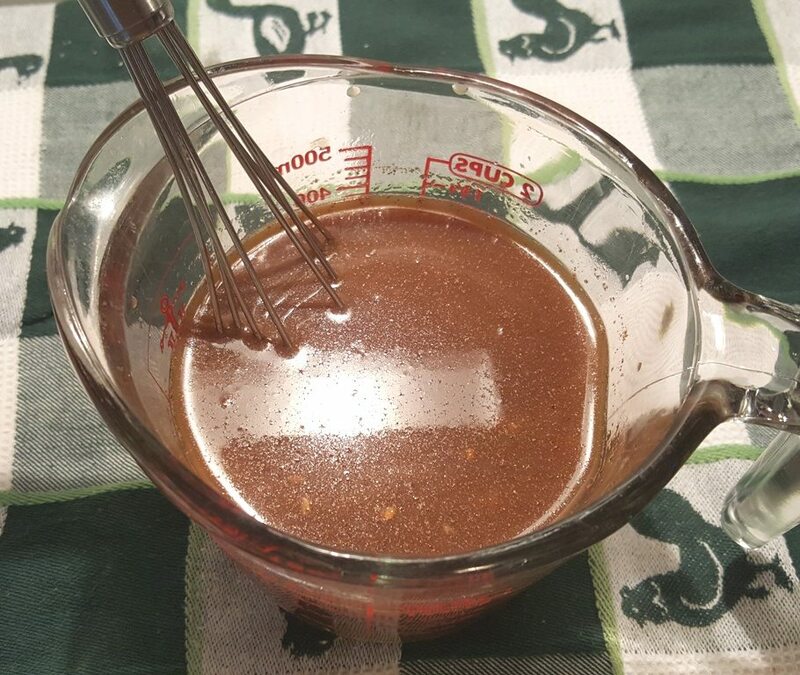 In a measuring cup or bowl, combine the sauce ingredients. Add Ghee and toss in all chicken, shaking off any excess potato starch prior to placing in the cooking pot. Lightly brown chicken on all sides. Add in peppers, carrots and onions and mix. 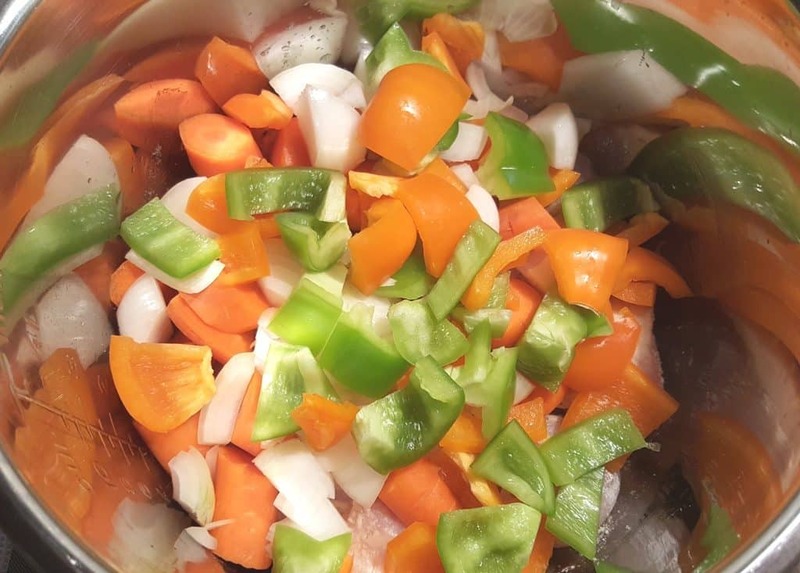 Turn off Pressure Cooker and pour sauce into Pressure Cooker cooking pot and mix through. Lock on lid and close Pressure Valve. Cook at High Pressure for 5 minutes. When Beep sounds, allow a 10 minute Natural Pressure Release, then release the rest of the pressure. 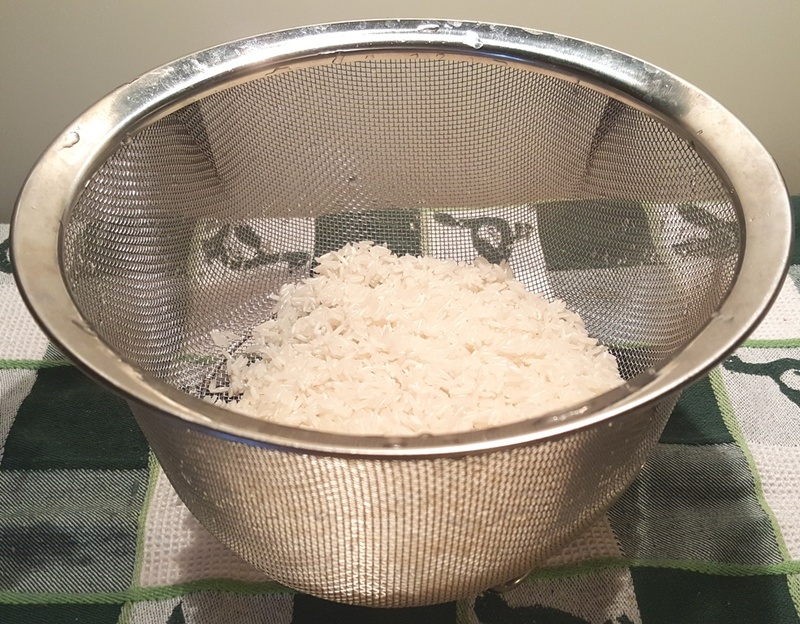 Remove lid and remove bowl of rice and trivet. Fluff rice. Select Sauté or Browning. Add in the remaining orange juice and pineapple chunks. Mix into chicken. Turn off Pressure Cooker after 2 minutes. Garnish with died peppers. PIN this Pressure Cooker Chinese Orange Pepper Chicken! Thanks so much. Braggs Liquid Aminos is a good sub for soy. Brown rice takes a long time to cook, so you would not be able to do it with this recipe. Thank you Jill! This looks delicious. Is there anyway to use your affiliate links on Amazon.ca? Thank you so much for asking. Here is the page of links. This looks delicious ! Is there something I could sub for Ghee? Hi are the peppers in the chicken mushy or crisp? Not talking about the ones you add after. The other day I tried this with broccoli and it turned to mush and I had to go out and buy more broccoli and salvaged the meal by just resautèing the broccoli for a delicious beef and broccoli. Hi, question and comment…I would like you to offer alternatives to items that are NOT readily available in local stores or even specialty stores. I called my “Bulk food” store and they had 2 items, I called an oriental store, she had no idea what I was talking about so told me to come in to see what she has on the shelf. So for 5 spice, Orange ginger, Healthy Boy Black Soy sauce are items I cann’t get to make this recipe tonight. So if you gave some alternatives to those of us ( at least me just starting out) I don’t want to invest in a lot of ingredients I many never use again. So instead of the Orange ginger spice, can I add maybe orange marmalade? Or Orange Zest and some shreddings from a fresh ginger, Regular and or low sodium soy sauce ok to use too? As you post started out…for those of us who just got their Instant Pot for Christmas.